It has been a busy winter here at Greenberry House, and I've been spinning hard trying to get ready for the new season. A highlight of the year for me is Sheep Shearing Days at Thistle Cove Farm, which is coming up on Saturday, April 4, this year. We'll be heading out early on Saturday morning with the spinning wheel and some lovely hand spun yarns from my wheel, as well as from Thistle Cove Farm and Wild Iris Wool. I'm excited about starting the festival season in Tazewell with the Lost Arts Guild! 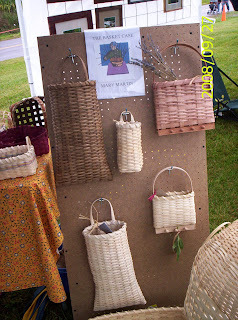 A sneak preview of some baskets I will have at Sheep shearing day on April 4, 2009 at Thistle Cove Farm. It should be a fun day for all, sheep shearing, good food, arts and crafts of many styles. Plan to come. A blog is a great way to get exposure, to promote yourself and develop markets; the best news, it's FREE! Blogger is home to this, the Lost Arts Guild blog, and, I believe is the largest in terms of numbers, but there are others such as Typepad and WordPress. I started with Blogger and find it to be the most user friendly but that's, probably, because I'm such a low tech geek and switching venues isn't something I have either the time or the inclination to do. Blogger is, constantly, updating or tweaking themselves and that means never running out of things to learn. A blog may be public, such as this one, or private where the owner permits a selected number of viewers. A lot of bloggers use the blog as an on-line journal, letting people keep up with their lives or, like the LAG blog, use it to promote and market themselves. There are others who use blogs to make money by selling adverts or having sponsors. The Pioneer Woman is a mid-west blogger who has advertisers on her blog who, at times, gives gifts to readers who write comments. BTW, The Pioneer Woman doesn't have a blog but chooses to journal via a .com site, a "regular" website. She's built a business around her blog, her on-line journal of her life as a cattle rancher's wife. It's a fascinating blog, visually rich with beautiful photographs and has an incredible splash, also known as an introductory, page that list her blog 'chapters'. From the front page the reader chooses where to go next - home and garden, recipes, photos, etc. If you want to develop a following, one of the best ways is to teach how you do what you do. In other words, give lessons or a tutorial. Again, The Pioneer Woman started doing this by posting recipes, detailing how to make each recipe and using beautiful photographs for each step. 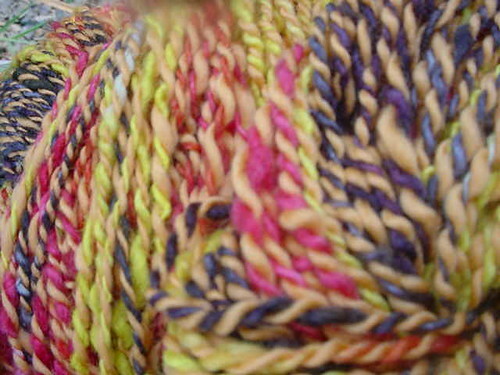 A lot of people in the textile and fiber arts give tutorials on how to knit, crochet, weave, etc. Elearningtech has a lot more information and suggestions about driving traffic to your blog. One suggestion is to use a Meme as a fun way to develop a discussion around a theme from blog to blog. Essentially, one lists a group of questions, answers them and then tags other bloggers to do likewise. Tip Junkie has built her entire blog around tips - collecting and sharing them - she even has a badge, or button, to show people have had their tips listed on her site. Micro-blogging is writing many, short, punchy entries and is a lot less time consuming than writing a detailed entry with photos. I find there are a variety of readers. Those readers interested in basket making, broom making, spinning, luthier work, ironwork and the rest of the work LAG members do would rather read a longer entry with photos. They want the languid pace they perceive to be yesteryear, a calmer and safer time. With those type readers, the short, punchy entries don't work as well as the lyrical type entries. You must find your own voice and your own writing style and be true to it. Another way to get increased exposure is to join groups, such as this one or other guilds that are particular to your craft. Both West Virginia and North Carolina have basketmaker's associations and, in 1997, the WV association grew out of the NC association. I couldn't see where either of these sites lists members' blogs but they should as it's another avenue to market, promote and publicize both the association and the members. The more exposure for everyone is a Good Thing. If other guilds don't have a blog, encourage them to start one or start it yourself. Low tech people, such as myself, have to be encouraged because stepping out of one's comfort zone is, generally, uncomfortable -smile-. Keep photos low resolution and put a water mark on each photo. Keeping them low resolution, around 300 dpi, means the quality isn't as good as high resolution and is a deterrent to people to print them off and claim them as their own. Putting a water mark, or a signature, on each photo lets people know you're the owner and your work is, by law, automatically copyrighted. On my, Sandra Bennett's blog, Thistle Cove Farm, I use the "same" photo but different seasons for the photo header. It allows people to see the farm, seasonally, but offers some visual diversity throughout the year. I'll re-use the same four photos, every year, for every season. In the lower right corner my name, Sandra Bennett, is the watermark and the resolution is around 300 dpi. Update frequently. You don't have to update every day but you do need to update frequently to keep people coming back. Updating frequently means your blog name, as well as names listed in your blogs, are 'out there' in the i-world and that means increased exposure. Also, put a following button on your blog so people can connect to your blog and receive a notice every time the blog is updated. These are but a few, quick suggestions on how to gain exposure via the i-net. There are vast articles written on promoting and marketing oneself; a quick surf through a search engine will lead you to more information. Please, let me know if this has been helpful. 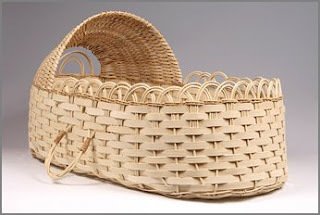 I am Mary Martin, one of the Lost Art Guild's member, I do basket weaving. I come from an Appalachian culture that lived the simply life. I love this life style and practice it today. My dad was a basket weaver. I later decided to do basket weaving. It is one of the arts I truly enjoy as well as quilting, knitting, gardening and canning. I live near Bluefield, VA on three acres of land. I have alpacas for fiber and boy are they fun animals. I am learning to spin there fleece. Please, forgive me but I've given an incorrect date for Sheep Shearing Day @ Thistle Cove Farm. The correct day is *always* a Saturday and is 4 April 2009. All other information is good. The 14th Annual Sheep Shearing Day @ Thistle Cove Farm takes place 5 April 2009. Clinton Bell, Master Shearer, starts shearing around 9 a.m. and finishes around 1 p.m. Our small flock of rare and primitive sheep include Shetlands, Romneys, Merinos and cross breeds. This is a working day on a farm; be a part of mountain community going back many generations. Lost Arts Guild members are invited to demonstrate and sell their traditional Appalachian crafts. Hopefully, everyone will attend: Larry Counts - broom maker; Leslie Shelor - spinner; Linda Wright - spinner; Bud Thompson - blacksmithy; Mary Martin - basket maker; Charlie Butcher - luthier, Sue Shelor - gourd artist; Kevin Riddle - coppersmith; Richard Vogel - woodworker and Sandra Bennett, textile and fiber arts. Hot food and drink will be sold by the Cove Community Association to support educational programs. Directions found at Thistle Cove Farm website; updates at Thistle Cove Farm blog.